Have you ever used salt in an art project? I have, and it was very fun. Read on, and you can make your own! After I wrote Children of the Sun, my family and I thought it would be even better if we could get bold, colorful, vivid illustrations made for the book. We wanted these to be good illustrations, not just amateur drawings, but we also hoped it could be drawn by the hand of a child. Then, we were able to find the solution—our art teacher, Mrs. Vicki Farmer, would help us—that is, my younger brother Arjun and myself—make the illustrations. Thanks to her, this book has become enriched with these illustrations. I had a lot fun making these illustrations. It was hard work sometimes, but the end results were very rewarding. Here, I’m going to describe how I made two of the illustrations in our book. You can easily make them, too, with common household items (except for the SpinArt machine, which you would have to find at a store). 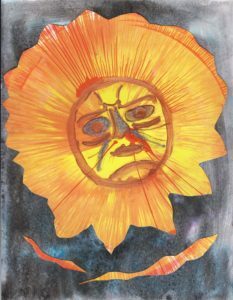 My favorite illustrations were the Angry Sun and the Calm Sun. These were both made in a very similar manner. We had to make the sun and its background separately. I made the Angry Sun and my brother made its background, while he made the Calm Sun and I made its background. That way, both illustrations were a combined effort of both of us. 1) In order to make the suns themselves, we each took a piece of 8.5x11 cardstock and placed it onto a SpinArt machine. When you turn on this machine, it spins in a circle around and around. You can adjust the speed, too. Once the paper was on the machine and it was spinning, we could take a paint bottle and just squeeze it onto the paper. Because the paper was spinning and our paint bottle squeezing paint down on top of it was stationary, the paint would end up on the paper in a circle. 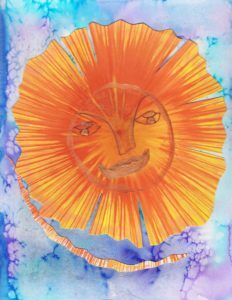 The design or color pattern that comes out cannot be predetermined, but since I used warm colors—oranges, reds, and yellows—in my spin art, the result is a blend that portrays a feeling of the hot sun. 2) Then, we waited for all the paint to dry before using scissors to cut the spin art into a sun shape, with pointed edges. 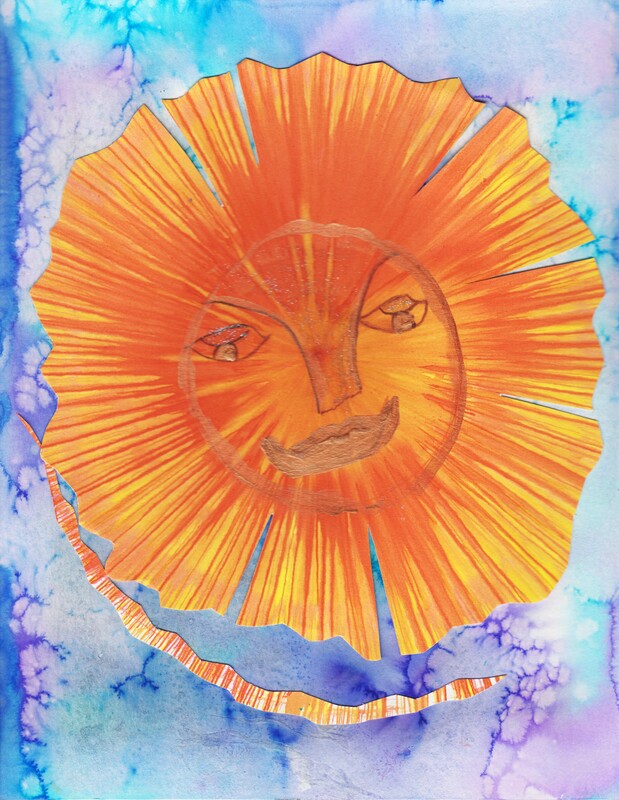 3) Next, we had to paint a face onto the spin art sun shape. First we sketched (with a pencil) a round face with eyebrows, eyes, a nose, and a mouth onto the sun, and then we went over it with metallic bronze paint. For the Angry Sun, we also colored in the iris (that is, all of the eye except the pupil, which was colored bronze already), nose, and wrinkles with silver paint. 4) Now that our suns were ready and the paint was drying, we set to work making the backgrounds. We each took an 8.5x11 sheet of watercolor paper and some shades of blue, black, and purple watercolor paints. We painted most of the edges of the sheets with these colors. We used much more of the black for the Angry Sun, and more light blues and purples for the Calm Sun. We didn’t have to paint in the center of the sheet, because we knew the suns would cover anything that was there once we glued them on. After we had finished painting the papers, we each took a pinch of salt and sprinkled it all over the freshly painted papers. Then we waited for the papers to dry. The salt caused all the watercolor to spread and form a very pretty design that you may notice on the finished artwork, especially that of the Calm Sun. After everything had dried, we brushed all the remaining salt off so that only the design made by the watercolor paint stayed. 5) Finally, when both the suns and their backgrounds had dried, we used glue to paste each sun onto its background. Also, when we had cut our spin arts into sun shapes, we had saved the scraps that were left behind. We now glued those scraps onto the background papers, as well, to add to the effect of the suns. I really hope you enjoy this illustration and everything else in our book. Maybe you could even try making a spin art with the salt effect yourself. And if you do, have fun! Previous Previous post: Have you ever used shaving cream for an art project?